If you are an affiliate then you should be quite happy today. Absolute Toner is now on a network for affiliate marketing. The goal is to get more and more customers saving money with us on all of there printing needs. Helping customers to save money when it comes to their printer supplies whether original or compatible products, we want to be there. This is where our affiliates can become part of us. By joining us and showing our website to your web clients you can will become part of our affiliate marketing program. What is it All About, Affiliate Marketing? It is simple, and it is quite easy for you to become grouped up with us. Affiliates makes money by bringing in people to our website, and when they make a purchase are given a commission. If you have a website or a blog site which you use, you can advertise on your website about Absolute Toner and increase your revenue stream. Why Join Absolute Toner Affiliate Program? Joining Absolute Toner is a great idea for many reasons. Starting with the fact that on our website you will find a quality premium product. You know this as we stand behind all of our compatible toners and inks with our Lifetime Warranty and Satisfaction Guarantee. Second, this is a product which is in constant demand. People are always looking for better options online. 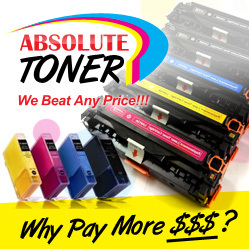 The internet has helped many people in finding better deals, you can be part of this with Absolute Toner. Our business is much more then turning over sales. It is out giving our customers a good experience with not just the price, but with the overall quality. If you are interested in joining our affiliate marketing program, please check out our sign up page which has many of our sign up details.